Writing a good book review takes a special blend of talents. First, some expertise in the subject matter helps. Second, it takes a bit of humility. (Too many people think that a book review about someone else’s work should be all about them.) Finally, the reviewer should skilfuly and succinctly tell readers what they want to know the most: What is the book about? How is it different than other books on the subject? And how well did the author do his or her job? 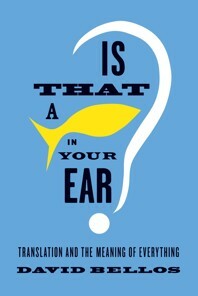 Is That a Fish in Your Ear? strikes me as the best sort of nonfiction, an exhilirating work that takes up a subject we thought we understood — or knew we didn’t — and then makes us see it afresh. Such high-order scholarly popularizations, accomplished with the grace and authority of a David Bellos, are theselves an irreplaceable kind of translation. One passage of the review resonated with me in particular. Dirda quoted Bellos as the author described the trust that was necessary for the readers of translated works to accept them as serviceable versions of the original. A translation thus is a pact between the translator and the reader. The translator promises to master the source material and convey it to his audience with all the different qualities of “truth” he can muster: emotional, factual, artistic, narrative. In a way, writers of non-fiction perform a similar translating function, and ask for the same trust from their readers. When a reader picks up a book of non-fiction, he or she expects it to based on a solid foundation of facts. But only the best writers with the most integrity and skill actually keep this promise.